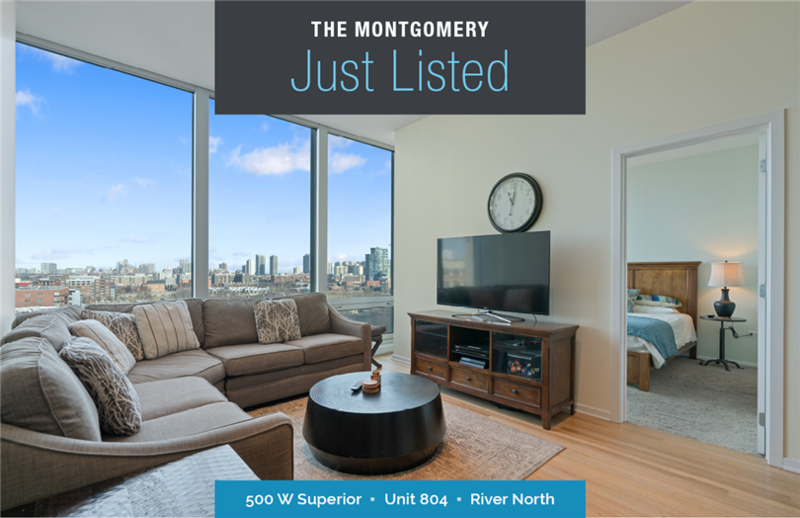 Welcome to "The Montgomery" in sophisticated River North! This home features 11' floor-to-ceiling windows for residents to enjoy sunrise to sunset views of the Chicago Skyline. From the entry to the home throughout the spacious living room are recently refinished hardwood floors. In the contemporary kitchen: Sleek Poliform espresso cabinets, granite countertops, stainless steel appliances. Master bath has a double vanity and soaking tub with shower. Guest bathroom features a walk-in shower. In-home side-by-side washer & dryer. 24/7 Door Staff, On-site Manager, Exercise room, Bicycle Storage, Dog Run, and Rooftop Terrace. Easy access to transportation, shopping, and dining. Heated garage parking space available for additional $35K.